Click on this text to watch: Endless Wars and How Much Israel Costs You? A stack of 3.8 billion dollar bills would reach the International Space Station. The new package to Israel will give Israel ten times that much money. How Should We Talk About the Israel Lobby's Power? ... The U.S. provides the Jewish state with $3.8 billion a year in aid, and has committed to doing so for each of the next ten years ... Again you might ask: What did the U.S. get in return for all this from Israel? And again the answer is: Nothing. Actually, worse than nothing. The U.S. suffers internationally from this alliance. Don't take it from me ... This grotesque distortion of U.S. foreign policy deserves a much wider debate, but is constrained by cheap accusations of anti-Semitism ... It seems to me that it is simply a fact that the Israel lobby uses money, passion, and persuasion to warp this country's foreign policy in favor of another country - out of all proportion to what Israel can do for the U.S. That comes perilously close to anti-Semitic tropes, but it's also the truth. ... This flood of Jewish money into foreign policy generation has done incalculable damage to the actual interests of the United States as Sullivan, to his credit, makes clear in his article. The point is that politics in America is all about money and Ilhan Omar was quite right to make that connection ... Andrew Sullivan pulls no punches in his article, which should be read in extenso. He writes "The basic facts are not really in dispute. A very powerful lobby deploys the money and passions of its members to ensure that a foreign country gets very, very special treatment from the U.S." and then goes on to detail exactly how Israel is a major liability to America. In what has been described as an “unprecedented gift of executive power to Israel,” the US Congress has passed for the very first time a law that forces the American president to give Israel a minimum of $3.8 billion per year - without limitation and no matter what Israel does. Israel enjoys GDP per capita of $42,120. In contrast, Japan's GDP per capita is $40,850. Israel has officially surpassed Japan when it comes to gross domestic product per capita, Prime Minister Benjamin Netanyahu said on Monday, a sign that the Jewish state is evermore affluent. Israel enjoys GDP per capita of $42,120 – which is calculated by dividing the country’s total economic output by its number of people. In contrast, Japan’s GDP per capita is $40,850. Netanyahu’s remarks, made at a Likud party faction meeting, signal that the country’s growing economic clout and its booming hi-tech industry is overtaking, on a per-capita wealth basis, Japan’s vaunted consumer electronics and automobile manufacturing. It’s yet another sign that Israel’s economy continues to outperform other peers in the West, including in the United States and the eurozone. The world average for GDP per capita is $11,730, according to the International Monetary Fund, while advanced economies enjoy an average gross domestic product per capita of $48,970. 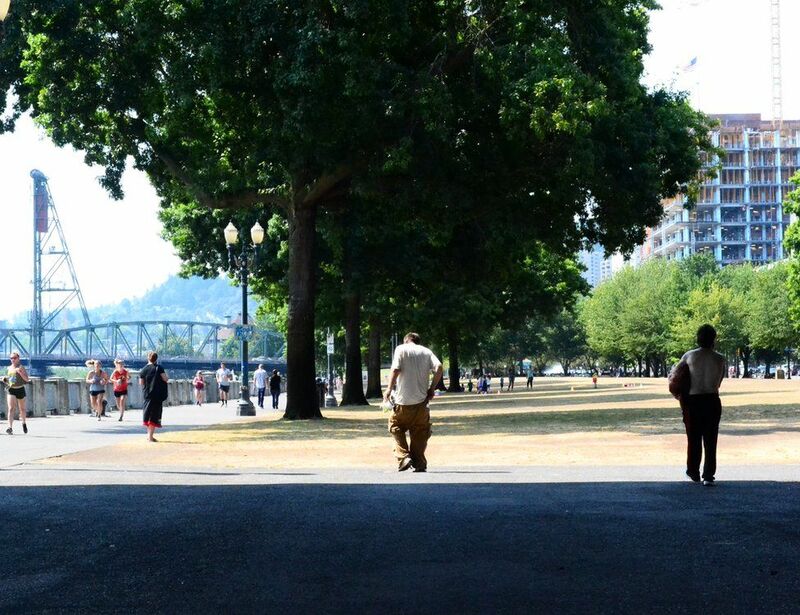 Vibrant Portland, Oregon's largest city, has long lured many. It is the City of Roses, of pleasant climate, rich culture and progressive thinking. 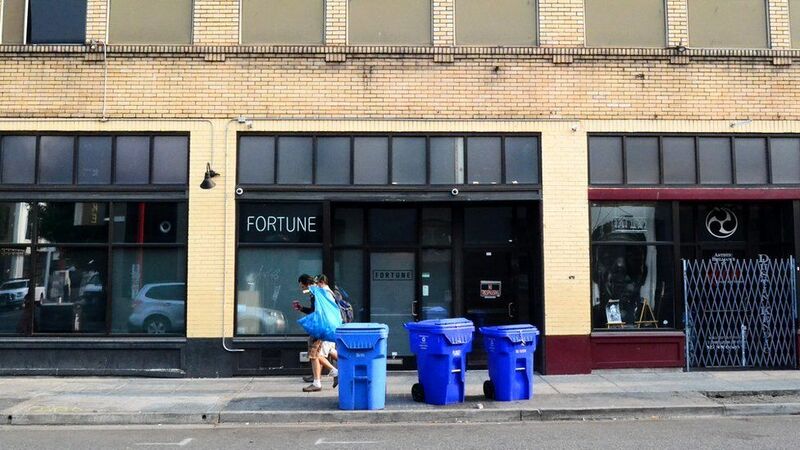 It is also an innovation hub, part of what is called Silicon Forest, and new residents have moved here in these post-recession years attracted by its high-tech companies and their well-paid jobs. "Even though the economy has never been stronger," Mayor Ted Wheeler, a Democrat, said, "inequality [is] growing at an alarming rate and the benefits from a [growing] economy are increasingly concentrated in fewer and fewer hands... We have increasing disparity all across the United States, and that's definitely impacting people." Declines in 30 states were overshadowed by big surges elsewhere, with California, Oregon and Washington among the worst. Los Angeles, where the situation has been described as unprecedented, had more than 50,000 people without homes, behind only New York City, which had some 75,000. 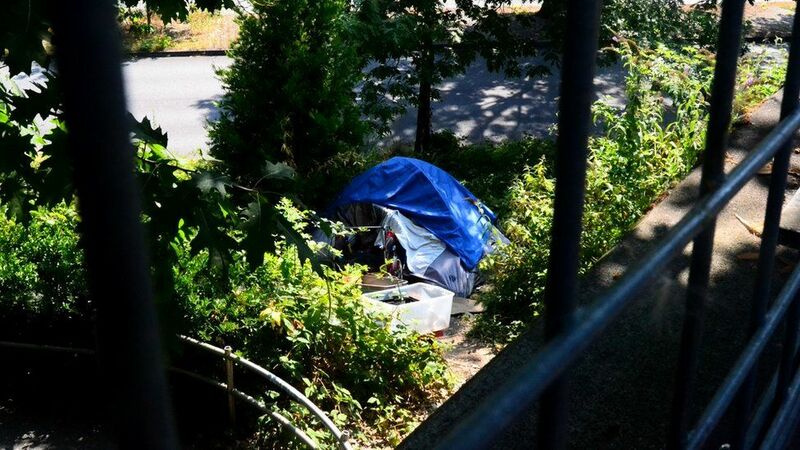 Joseph Gordon, known as Tequila, has lived in a homeless camp called Hazelnut Grove since its creation in 2015, when Portland first declared a state of emergency over the crisis. "It's very scary. [The] people I have come across," said the 37-year-old, "are from every single walk of life. And the homeless population is getting bigger and bigger." 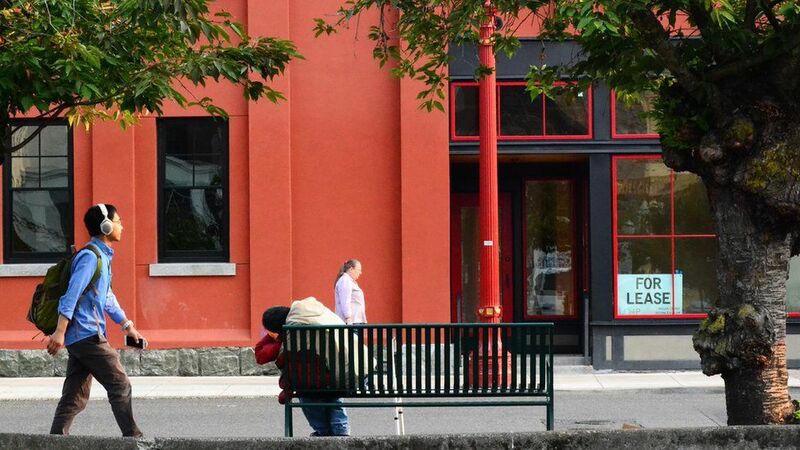 Multnomah County reported 4,177 people homeless on a single night last year, a 10% rise from 2015 - many believed the number was even higher. 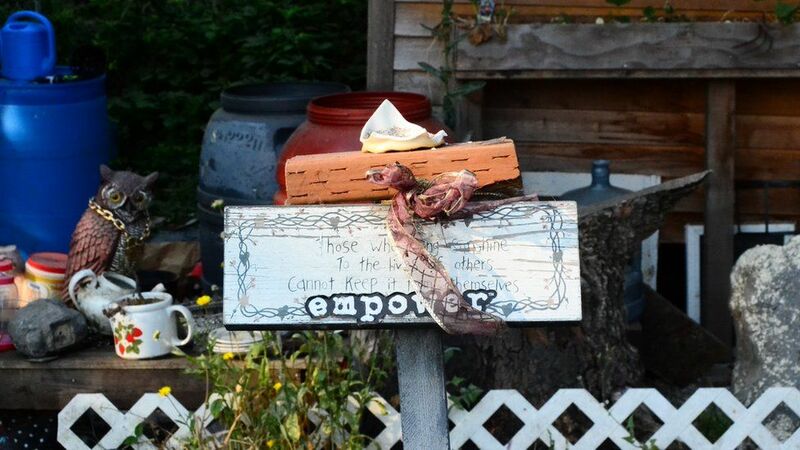 Exposing tensions, the president of Portland Police Association controversially said in July the city had become "a cesspool", a comment the mayor dismissed as "ridiculous". 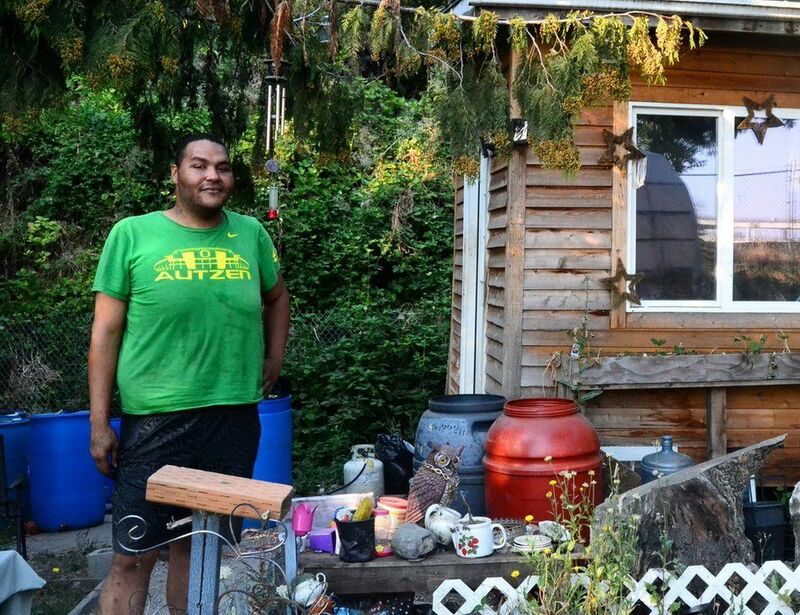 The self-governed community of small wooden structures next to a highway had more than a dozen residents, half of them with some sort of income, Tequila said. "If there was access to actual affordable housing they would take it." "We have a housing market that's really unaffordable for folks at the lowest income level," said Shannon Singleton, Executive Director of Join, a charity that helps homeless people return to permanent housing. "There's a real lack of hope. Folks are struggling to see the ability to end their homelessness and get back in the [market]." While some defend Tequila's camp as a model for an alternative solution, authorities have said it will, eventually, have to go. No date has been set yet but there have been troubles with nearby neighbours recently. Australian academic Philip Alston, the UN special rapporteur on extreme poverty and human rights, travelled across the US for two weeks last December in a mission that included visits to Los Angeles and San Francisco. It resulted in a scathing report in which he said the American dream was, for many, rapidly becoming the American illusion - the Trump administration strongly criticised his findings. The future, he warned in an interview, did not look promising. "The federal government's policies under this administration have been to cut back, as much as possible, on various housing benefits and I think the worst is probably yet to come." 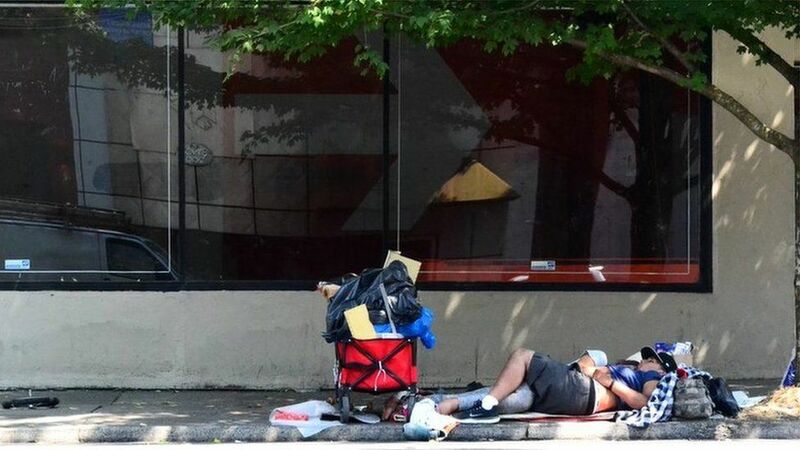 Other rich countries have faced rising homelessness, too, as the most vulnerable feel the burden of austerity policies, rising costs and unemployment. But in most parts of Europe, for example, there was still a "robust welfare safety net", Mr Alston said, to help those at risk. "In essence, if you're in Europe, you get access to necessary health care, psychological, physical rehabilitation... That contrasts dramatically with the US." In Portland, the police oversight agency is reviewing how officers interact with homeless people - many suffering from drug addiction and mental health issues - after a report suggested they accounted for 52% of the arrests recorded last year, despite being a tiny fraction of the local population of some 640,000. 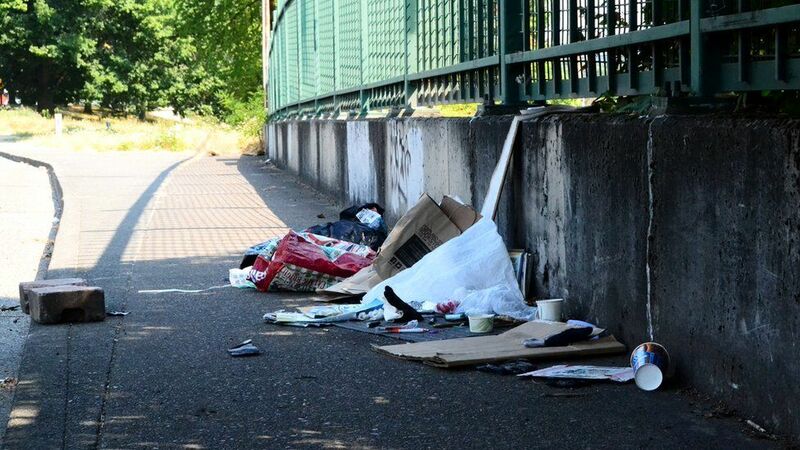 "People are simply trying to survive and they don't have means to do so," said Kimberly McCullough, Policy Director of the American Civil Liberties Union (ACLU) of Oregon. "We're seeing a crisis of our humanity and how we're going to treat and help each other." Tequila, however, was not surprised. "Of course there are tensions," they said. "If a police officer is having a bad day... the easiest target is a homeless person, especially the ones who are by themselves." 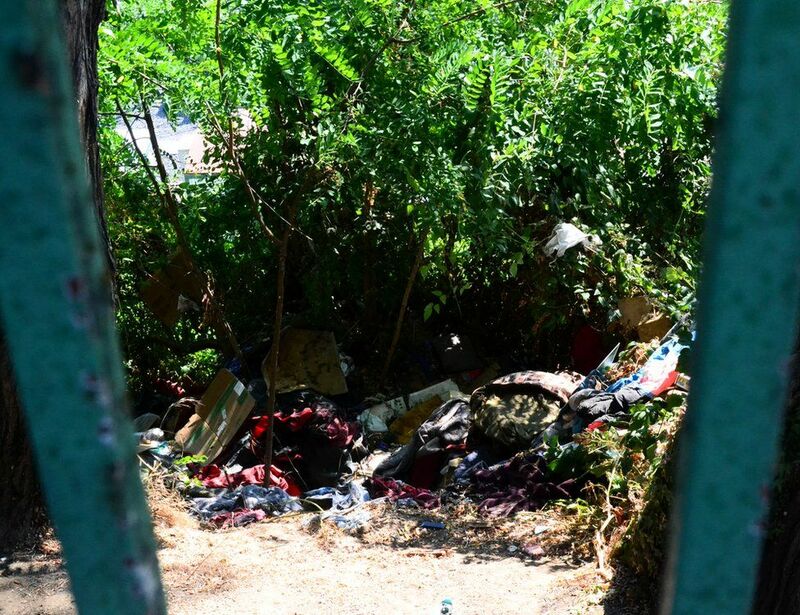 "A high homeless situation is not a good [sign], especially when you're the richest country," Tequila said. "There's very little hope. It's a dire situation." Why Does the United States Give So Much Money to Israel? The two countries just signed a new military-aid deal—the biggest pledge of its kind in American history. It have may seemed inevitable, but the record-setting moment is also rife with irony. U.S. and Israeli officials sign an unprecedented military-spending deal in Washington, D.C., on September 14. The United States and Israel have made it official: The two countries signed a new 10-year military-assistance deal on Wednesday, representing the single largest pledge of its kind in American history. The pact, laid out in a Memorandum of Understanding, will be worth $38 billion over the course of a decade, an increase of roughly 27 percent on the money pledged in the last agreement, which was signed in 2007. The diplomatic and military alliance between the two countries is longstanding: Even prior to this week, Israel was, according to the Congressional Research Service, “the largest cumulative recipient of U.S. foreign assistance since World War II.” In many ways, Wednesday’s deal seemed predestined. Yet, it’s also ironic. Barack Obama has a notoriously cold relationship with Israeli Prime Minister Benjamin Netanyahu—as my colleague Jeffrey [JEW} Goldberg wrote in The Atlantic’s April cover story, “Obama has long believed that Netanyahu could bring about a two-state solution” to the Israel-Palestine conflict “that would protect Israel’s status as a Jewish-majority democracy, but is too fearful and politically paralyzed to do so.” Nonetheless, Obama will leave office having out-pledged all of his predecessors in military support to the country Netanyahu now runs. Aid to Israel is among the only static issues of this U.S. election season. While the Republican presidential nominee Donald Trump has made somewhat mixed statements on the Israel-Palestine conflict, he has also made strongly worded promises to strengthen the relationship between the United States and Israel. For her part, the Democratic nominee, Hillary Clinton, has consistently touted her support for Israel, including during her time as secretary of state. Voters, however, have more mixed views on this kind of support. While more than 60 percent of Americans were more sympathetic to Israel than the Palestinians in a 2016 Gallup poll, sympathies differed along partisan lines, with around half of Democrats being more sympathetic to Israelis versus nearly 80 percent of Republicans. In a separate Brookings poll, roughly half of Democrats who responded said Israel has too much influence on the United States government. Boycott, divest, and sanction movements, which call on organizations in the United States and abroad to cut their financial ties with Israel, have long been popular on college campuses, although somewhat marginal; this year, however, they got a boost from the Black Lives Matter movement, which included statements against Israel’s treatment of Palestinians in its recently released policy platform. All of this creates an odd backdrop for a historic military-spending deal. No matter how bad the relationship between the two countries’ top leaders, no matter who gets elected to the White House, no matter how loudly some voters voice their opposition or how charged the underlying ideological debate: The United States has pragmatic reasons to keep providing large sums of money for Israel’s military. There are straightforward explanations for why this particular deal got done. Politically, the spending package was partly a response to the nuclear deal that the United States and other world powers finalized with Iran in July of last year, and which Obama hailed as cutting off Iran’s pathway to nuclear weapons for more than a decade. Netanyahu was harshly critical of that agreement, which he called a “historic mistake” that would ease sanctions on Iran while leaving it with the ability to one day get the bomb. “Even with the deal in place, and taking the nuclear-weapon capability of Iran off the table at least for the next 10 to 15 years, there are still considerable destabilizing activities that Iranians are pursuing in the region that are not consistent with U.S. or Israeli interests or objectives,” said Melissa Dalton, a senior fellow at the Center for Strategic and International Studies. The new money is an attempt to pacify Israeli concerns about continued threats from Iran, she added.